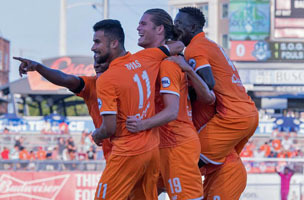 Just LIKe that, the Tulsa Roughnecks FC are back in winning form. 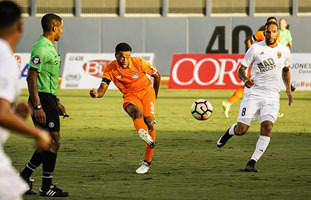 After a tepid performance in June the Roughnecks have rallied to an unbeaten record in their last four matches, with a total of three wins and a draw. After stunning Real Monarchs SLC 2-nil at the home grounds at ONEOK Field, the Roughnecks handed a 2-1 loss to arch-rival OKC Energy FC on their home pitch. 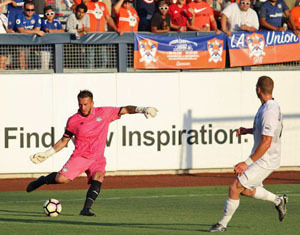 A trip to the left coast saw the road-weary TRFC battle LA Galaxy 2 to a 2-all draw two weeks ago and on Saturday night, on what was an historic evening for the soccer community in Tulsa, the Roughnecks dominated Phoenix Rising and clean sheeted them with a 3-0 victory. Goals from TRFC leading scorer Ian Svantesson, Jacori Hayes, and newcomer Christian Thierjung as well as heroic goalkeeping by Fabian Cerda brought the team to .500 on the standings sheet at 8-8-1 with 25 points, good enough for fifth place in the USL Western Conference. The first goal of the match came from a familiar combination, Juan Pablo Caffa and Svantesson, as Caffa airmailed a cross on a corner kick to Svantesson who headed the ball past Phoenix goalie Josh Cohen to give the home side a 1-0 lead at the 15 minute mark. The goal was Svantesson’s eight of the 2017 season, and he leads the team in goals. Jacori Hayes got his first USL goal in the 44th minute when Paris Gee broke free on the left side and sent a crossing pass into the penalty area the bounced off a Phoenix defender onto the foot of Hayes who punched the ball in past Cohen to give the Roughnecks a comfortable two-nil advantage at the break. Phoenix Rising emerged from the locker room with a fire lit under them, desperate to put their mark on the ONEOK Field scoreboard through much of the second half. The outstanding backline in front of Cerda thwarted every effort, however, allowing for the Roughnecks to seal the victory with a goal from their newest player (and FC Dallas loanee), Christian Thierjung. Fabian Cerda booked his fourth clean sheet of the year. In the 85th minute, on the right side of the penalty area, the former San Jose Earthquakes draft pick hit a full-volleyed shot past Cohen and into the far corner of the goal to make the final score 3-0. The clean sheet (shutout) turned in by Fabian Cerda on the night was his fourth on the year and he only had to make four saves on 6 shots. From here the Roughnecks hit the road to Utah for a rematch with Real Monarchs SLC next Monday evening at Rio Tinto Stadium. Next home match for the Roughnecks is on August 5th when they host Reno 1868 at ONEOK Field. This entry was posted in Sports on July 24, 2017 by admin.